Vogt Visuals recommends and assists companies to manage their email through a stand-alone Google account, or through an organization's Google Apps account. Long story, short: thins means you can have all your email addresses managed under one roof. And the management is good. The nice thing is you can have multiple email addresses come into a single inbox, and when you respond, you respond with the same email addresses it was sent to. This is done through forwarding email addresses to a single Google Account. 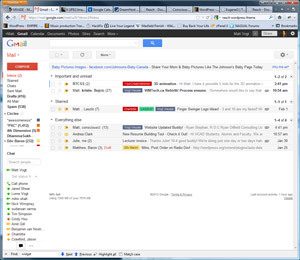 A label in Google Mail, is like a folder except you can apply multiple labels to a single email chain. Therefore, like a tagging system. These coupled with neat titles and colors (we're a visual company) allows me to see what's up with relative ease as well as the ability to sort and view labels regarding projects etc. You can even nest labels within labels such as Client Name > Account Details etc. Coupled with Filters we're off to the races! This was amazing for me! Turning this option on, by the Inbox link, left sidebar, enables Google Mail to learn what's important and what's not. Stuff directed at me, stuff I respond to, becomes priority with what I see... stuff I archive, or don't even open etc becomes less of a priority. Back to working visually, this helps me tremendously as it moves the good stuff up top! The old problem of having newsletter emails in between important, respondable ones is finally solved! (I sometimes respond to newsletters too... if you're lucky). It's all good! I also use Google for their Docs and Calendars - especially in business. More on this later! Stay tuned sports fans. I never realized this but hitting M on a message will mute it. See what a muted message can do for you here!